Stewardship programs in British Columbia are guided by the Environmental Management Act. These programs are typically created as non-profit organizations that are funded by fees. The fees cover program cost such as advertisement, management staffing, collection, transportation and safe disposal. Typically these fees are displayed separately at check out and are subject to GST and PST taxes where applicable. AlarmRecycle accepts used or expired smoke alarms, carbon monoxide (CO) alarms and combination smoke & CO alarms for recycling. Old alarms can be taken to Sardis Bottle Depot or Chilliwack Bottle Depot for disposal year-round. For more information, visit /main/link.cfm?id=2321smoke-co-alarms/british-columbia/. In October 2011, the Canadian Electrical Stewardship Association (CESA) launched ElectroRecycle in British Columbia. ElectroRecycle accepts over 120 small appliances ranging in size from countertop microwave ovens, irons and portable fans, to electric toothbrushes and vacuums. For a full list of small appliances that are accepted in the Unplugged program , please visit http://www.electrorecycle.ca/. Old or broken appliances can be taken to the Sardis Bottle Depot or Chilliwack Bottle Depot for disposal year-round. LightRecycle, BC's not-for-profit light recycling program, accepts for FREE both residential lighting products and used in commercial and industrial applications, including PCB-containing ballasts. Certain groups may also qualify for a free pick-up service - call 1.888.772.9772 or email pickup@lightrecycle.ca to inquire. Burnt out compact fluorescent lights (CFLs) and fluorescent tubes (residential use only) can be taken to a collection site near you. Many retailers already accept these products: Canadian Tire, Rona, London Drugs, as well as the Sardis Bottle Depot and Chilliwack Bottle Depot. Please contact LightRecycle at 1-800-667-4321 or visit www.lightrecycle.ca for more information. Free collection of electronic materials (computers, televisions, computer monitors and computer peripherals) began June 2007. In Chilliwack, electronic waste can be taken to the Sardis Bottle Depot or Chilliwack Bottle Depot for disposal year-round. For more information about E-waste recycling, go to https://www.return-it.ca/electronics/. In 2006, the BC Recycling Regulation was amended to include a tire product category. The regulation makes the producer (manufacturer, distributor, importer, retailer) responsible for the life-cycle management of their products, including financing the collection and recycling of discarded products. Passenger, light truck, and motorcycle tires will now pay an Advanced Disposal Fee (ADF) of $4 per tire. More information can be found at http://www.tsbc.ca/pickupdropoff.php. Used household batteries can be dropped off at a number of local businesses operating return-to-retail programs including RONA, Future Shop and London Drugs. In December 2008, the Ministry of Environment amended BC's Recycling Regulation to include alkaline batteries. The following website provides more information:http://call2recycle.ca/. Alkaline (non-rechargeable) can also be taken to the Sardis Bottle Depot or Chilliwack Bottle Depot for disposal year-round. Lead-acid batteries can be returned to the Sardis Bottle Depot, Chilliwack Bottle Depot, or Canadian Tire. The British Columbia Used Oil Managment Association (BCUOMA) have set up a network of drop off locations for used oil (including engine oil, transmission fluid, and hydraulic fluid), antifreeze, oil filters, and empty plastic oil/antifreeze containers. For a list of places that accept these materials visit http://bcusedoil.com/. In Chilliwack, waste residential paint and paint containers can be taken to the Chilliwack Bottle Depot or the Sardis Bottle Depot for disposal year-round. The Chilliwack Bottle Depot is a "Paint Plus" Depot, which will also accept other household hazardous wastes, including flammable products, pesticides and gasoline. The products must be in their original containers. Gasoline must be in approved ULC containers (jerry cans). For more information, visit the ReGeneration website. 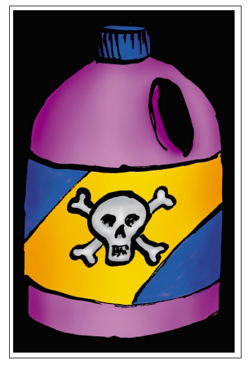 Household hazardous wastes can also be taken to the City's annual Household Hazardous Waste Day for proper disposal. Unused and expired medications can be taken back to your pharmacy for safe disposal. Accepted materials include all prescription drugs, nonprescription drugs, herbal products, vitamin and mineral supplements, and throat lozengens. For more information on what is accepted by this program, click here. This program requires all brand-owners and sellers of beverages in BC other than milk to have a stewardship plan approved by the Director. Although beverage containers are accepted through the Curbside Recycling Program (no glass beverage containers), placing them at the curb should be avoided to prevent scavenging. Alternatively, beverage containers can be returned for a refund at bottle depots (Chilliwack Bottle Depot and Sardis Bottle Depot) and major grocery stores, or donated to agencies or groups for fundraising purposes.